Newsletters is rated 5.0 out of 5 by 4. 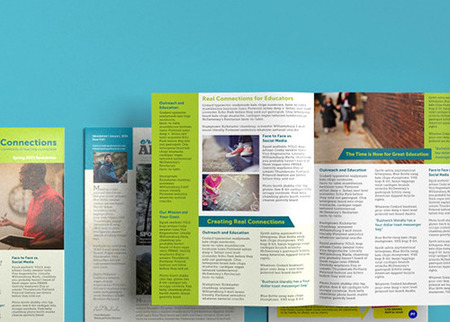 Create your best newsletters yet with the right options from PrintPlace.com. "The newsletters that I have produced through PrintPlace have increased donations for non-profits and upped their visibility in their market. I use PrintPlace because of low cost and high quality for the money"
Monte Hist, Hist & Fritz Creative Media, Inc. Rated 5 out of 5 by AmandaOutside from Great Overall! We bought this product for our non-profit newsletter. It looks fantastic and it's convinient and affordable to have PrintPlace fold and tab it too! Rated 5 out of 5 by Kathryn from Great Staff Assistance PrintPlace staff including initial phone support to the art team were fantastic - assisting in some time-sensitive special requests. I am so appreciative of their professionalism and "can do" efforts. Rated 5 out of 5 by sharonj430 from Great Job! I ordered a newsletter/program for the first time from the Print Place. We needed them for a conference, and were on a tight deadline and budget. There was no time for reprints if something went wrong, so I was apprehensive that my program would be printed correctly. I don't know why I worried - the program was beautiful. I loved the paper, the printing looked fantastic, it was stapled perfectly, and it arrived a day ahead of schedule. Thank you, Print Place, for making us look good. Business newsletters are a fantastic way to reach out to current and potential customers with current events and other recent happenings within your company and industry. They are more personal than brochures and postcards and have room for more information. Newsletters are quick and easy to print with our online ordering tool, and we offer quantities as low as 25. This makes professional newsletter printing affordable for even small businesses and organizations. Simply upload your artwork, specify the number and options you’d like, and we will take care of the rest! Use our newsletter layout templates to ensure that your artwork prints correctly. The layout templates come in two different format options for newsletters: InDesign and Publisher. Your custom printed newsletters are eligible to mail at letter or flat rates, depending on the final/folded dimensions. Direct mail services for newsletters include: processing 1 mailing list, duplication removal if requested, CASS Certification, inkjet addressing, and postal presorting for automation rates. This is all included in the direct mailing cost of $35 per 1,000 newsletters, plus a $150 setup fee (minimum 250 pieces). Triple tabbing is required to mail half folded newsletters at letter rates. Triple tabbing can be added during the ordering process. Read our “Newsletter Mailing Requirements” for detailed folding and tabbing guidelines. Newsletters keep your customers, prospects and members informed, and because of the frequency, keep recipients in close proximity to your brand. The front cover should include a masthead with a design or graphic that is constant with each issue, allowing your audience to quickly recognize your company. For maximum benefit, keep your content interesting and relevant to your audience. A newsletter is a good place to craft your brand around more than just your products. Sharing facts about your business and stories about employees will build loyal relationships with your customers.